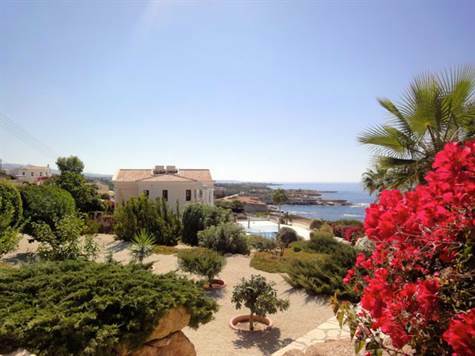 Sea Caves, Paphos - This 5 bedroom exclusive sea front residence with unobstructed views of the Mediterranean is located in the prime location of Sea Caves. Awarded the Bentley International Best Cypriot Property, this luxury villa is situated above a small cove which is easily accessed for swimming and exploring the local caves. The property has been custom built for the current owners and is designed on three levels to take best advantage of the stunning location and magnificent views and sunsets. On the ground floor is the main living accommodation with split-level lounge, gourmet kitchen and dining area, utility room, study and guest cloakroom. On the first floor are 4 bedrooms, all with en-suite facilities and fitted wardrobes. Looking through the patio windows, which provide easy access to the balcony from each bedroom, the feeling is like being in a luxury ocean liner. On the lower floor is a Snooker/Games room with fitted bar - perfect for parties and entertaining. Steps lead down to a bedroom and bathroom, ideally suited as maid’s accommodation, and there is access to the double garage and workshop. The specification is amazing, and great attention to detail has been given to the quality of materials and finishes, and the overall comfort and ambiance of this luxury home. The property comes fully furnished and has full title deeds. A full inventory can be provided on request.